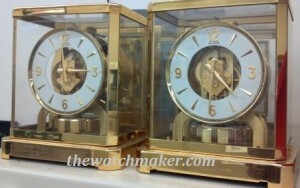 One of our specialties at The Watchmaker is the service of the LeCoultre Atmos Clock. This clock has been in production for about 75 years, and the design has not changed much in all that time. These clocks run perpetually, without winding, just by subtle changes in temperature. As the bellows expand and contract, the clock winds itself. It is one of the finest clocks manufactured in the world; but like everything, it will eventually need service. The repair we provide consists of a complete disassembly, inspection, and servicing of the mechanism. We use only genuine LeCoultre components. Our service comes with a one year performance warranty, but it is quite common for these to run for 15-20 years between service. Trust your Atmos clock to the experts. Please call for details. If you are local to the Boston area, please bring your clock to our store, located at 379 Main St in Stoneham Square. If you are not experienced with shipping this type of item, we recommend bringing your clock to your local UPS store. They will have experience packing and shipping. *Before moving your clock, always lock the pendulum. To lock the pendulum (on most Atmos clocks), there is a lever on the front base of the clock which slides from left to right. Once the pendulum is locked, it is safe to move the clock freely. Moving the clock with the pendulum unlocked can damage the mechanism. I just got the watch today after work. Everything is in perfect working condition and it looks great! Thanks for helping me get my first watch!